We had a surprise litter in the bunny barn! Our 'retired' brown Mini Rex doe had a rendezvous with one of our Blue-Eyed White Holland Lop bucks, and this adorable litter of 5 holland lop/mini rex are the result! We didn't know they even existed until we came into the bunny barn one Sunday morning and were greeted by these little rockets darting all over the barn. We've been handling them every day to gentle them since then. 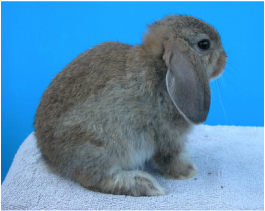 As you can see from the photos, they will most likely have the flat nose of the Holland Lop, and the upright ears of the Mini Rex. There are 3 solid black, and one chestnut (brown) available. Update (5/14/2017) - the chestnut and one black are off to their new homes. For Sale - $150 Blue-eyed white doe - $150. 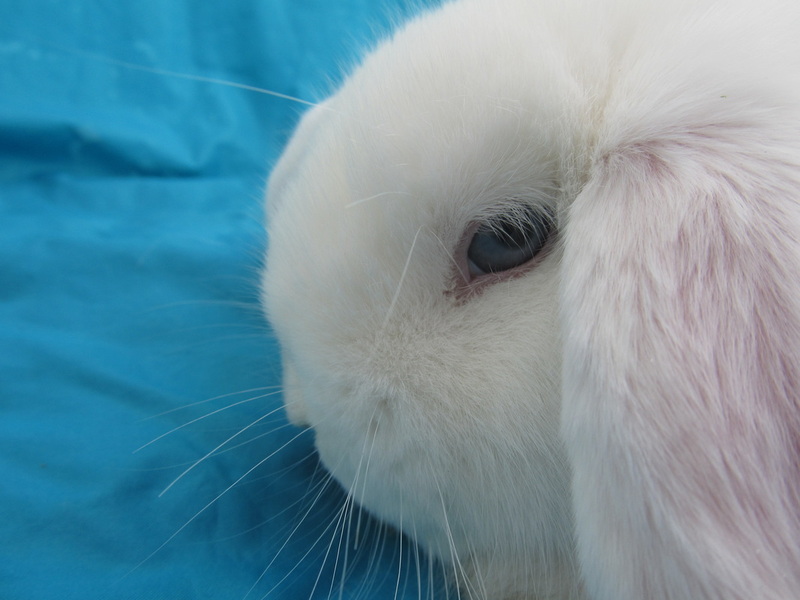 These beautiful snow white holland lops have striking blue eyes. We only have 3-5 of these a year, and they go quickly, so reserve yours now! They will be available to go to their new homes on May 14, 2017. There are 2 females and one male. We require a $20.00 nonrefundable deposit be paid in order to place a bunny on hold. Please see sales and hold policies. Babies are available when weaned, typically about 8 weeks, occasionally a little sooner. 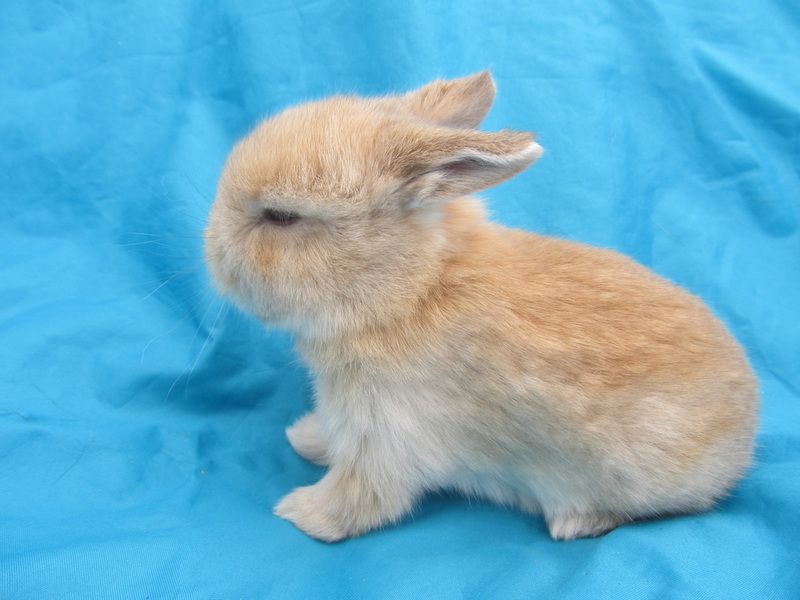 We currently have a litter of 4 adorable Holland lops - 3 orange and one chestnut. They will be available to go to their new homes on May 14, 2017. The chestnut is a female, Smoky (gray smudged nose) is a male, and the other 2 oranges are females. As of 5/1/2017, Smoky is reserved - his new home is Liberty Hill! as of 5/5/2017, the chestnut male is reserved - His new home is Hutto! As of 5/10/2017, the last orange female is reserved - her new home is also Houston! We are reducing our herd. This is Blueberry Butterscotch. She is a broken orange - only it's a smoky, almost caramel orange, really striking. She also has lovely blue-gray eyes. She only has produced one litter, which was born too early, so I would not use her for breeding, but she has a sweet disposition and would make a great pet. She was born Jan 15, 2015, which makes her about 1.5 years as of 8/2016. She is out of Wren's Alexis, sired by Wren's Lolly. SOLD! This trio of babies is the first group of bunnies we've raised since we moved last October. Our mama bunnies didn't take the move well, and they all miscarried, then didn't get pregnant again easily. We have loved on these little guys so much! More details on each one below. ​This beautiful Vienna Marked doe has the most beautiful blue eyes. This sweet girl is a broken orange with blue eyes. She is out of SBB's Boo, sired by Wren's Honeybun. 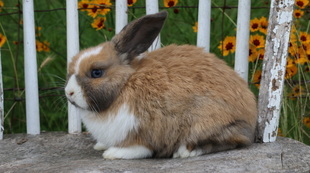 Orange Holland Lop Buck out of SBB's Boo and Wren's Lolly. We've nicknamed him 'Tiger' because he has a black mark on his forehead and two black stripes on his right side. 8 weeks old and ready for her new home July 28, 2015. 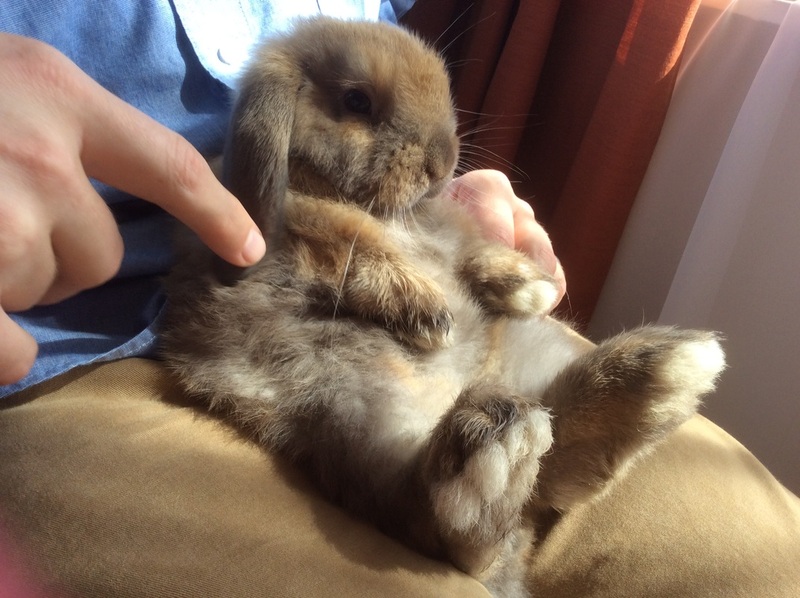 Tort Holland Lop Buck out of SBB's Jewel and Wren's Lolly. Super-sweet and ready for his new home! 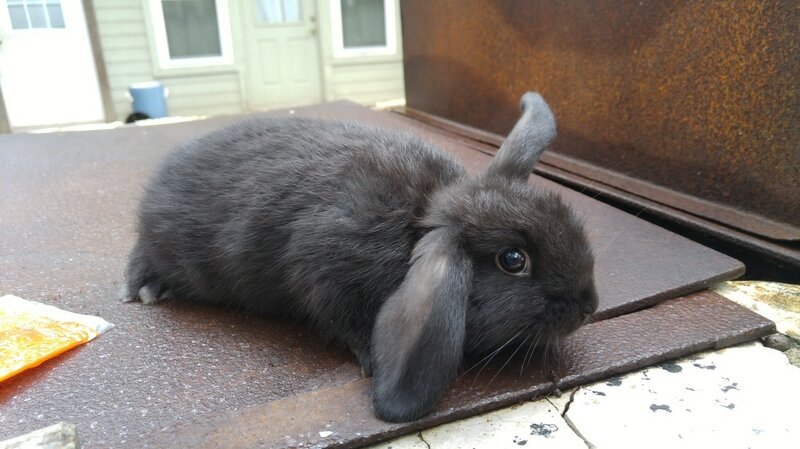 Orange Holland Lop Doe out of SBB's Boo and Wren's Lolly. 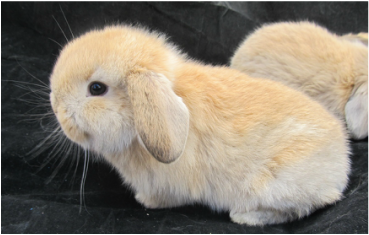 Orange Holland Lop Doe out of SBB's Boo and Wren's Lolly. She has a little blaze of white on his forehead. She is the runt of the litter, so is very tiny, and is also very healthy and active. Born March 5, and ready for her new home on April 30, 2015.
out of SBB's Jewel and Wren's Lolly. Ready for her new home April 16, 2015. She would make a great pet or breeder. BEW Buck, out of Wren's Alexis and Wren's Lolly. He was not very cooperative on the day we took photos--just wanted to sleep! VM doe, out of Wren's Alexis and Wren's Lolly. She is truly a beautiful rabbit - her eyes are the same color as some of her fur. Like her sister above, she has a large head and wide crown. She would make a wonderful pet or breeder. 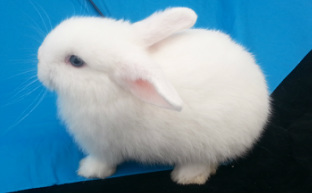 Pictured here is the last one in a litter of 4 out of Velvet and Roxie- a lilac male Mini Rex. He is beautiful, gentle, and handled almost daily. He was 8 weeks old as of January 8 and is ready for his new home! We have a very friendly black male bunny (front). 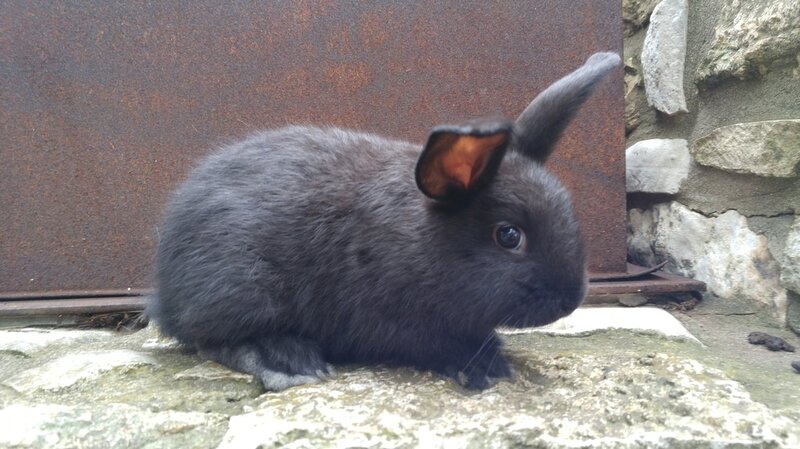 His mother is a Netherland Dwarf/their father a Mini Rex. He has been loved on by our family daily, and fed an excellent diet of hay and rabbit pellets supplemented with dark leafy greens and wheatgrass. As of Oct 4, he is 4 months old. As a mixed breed, he is the best of both breeds--he has the compactness of a Netherland Dwarf and the inquisitive, bold nature of a Mini Rex. He will likely be less than 3 lbs when full-grown. (His mother and father were both well under 3 lbs.) He is ready to go home with his new family today! 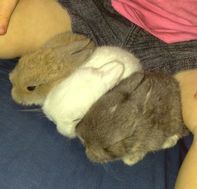 4 Mini Rex kits out of Velvet (lilac) and Roxie (chocolate). Roxie has 2 best of breeds in his pedigree. Ready for new homes: October 18, 2014. He would make a great show rabbit or pet. Jessie has been a member of our family for the last year, and everyone agrees that she is a sweetheart. She is very undemanding of time, yet when allowed out of her cage, is inquisitive and enjoyable to watch as she explores. She is also quite content to sit on your lap for long periods of time. 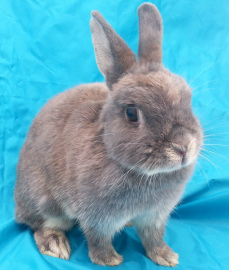 We want to find a new home for her because we breed and sell pet rabbits and need all the cages for the producing does. 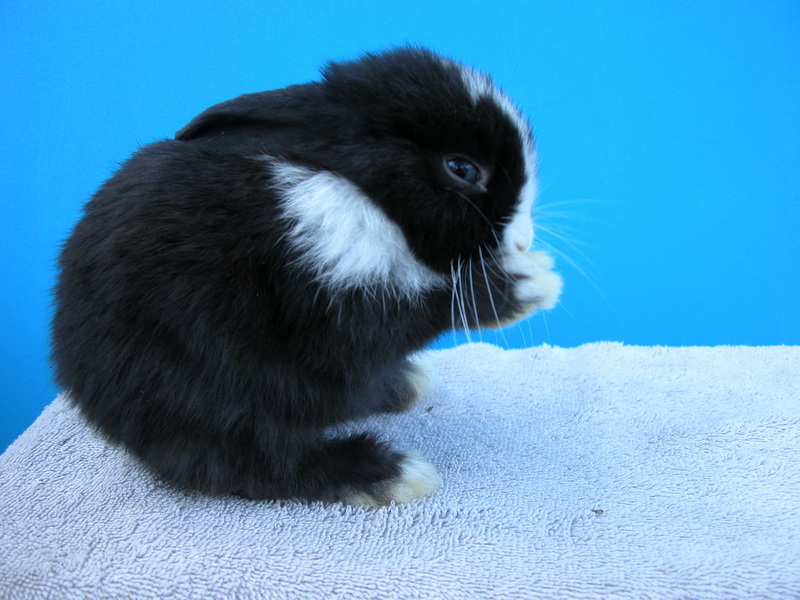 She has never had a litter, and is too old to have one (female rabbits' pelvises fuse after about 1 year), so only buy her if you don't plan to breed her. She would make someone a great pet. Rabbits come with as many personalities as people--a few can be quite mean, but this gal is a true sweetheart, and used to being handled regularly, even by our 6 year old. 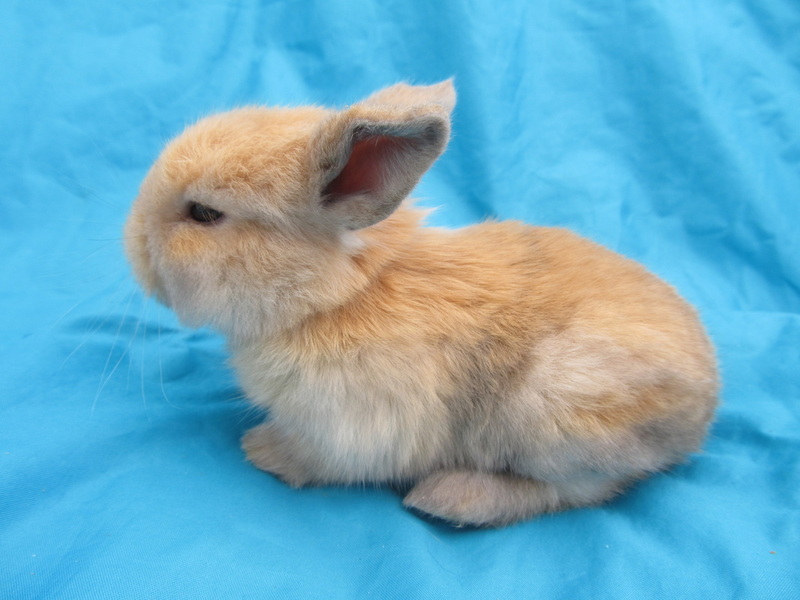 Average lifespan for a Netherland Dwarf is 5 - 10 years, so plan accordingly. Her adoption fee is $25. She will come with a quart-size ziploc bag of feed (so you can transition her gradually to whatever pellets you choose) and a small bag of hay for the first few days. Thank you, and give us a call if you think Jessie may be a good fit for you!